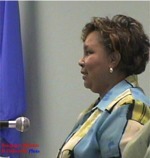 July 21st City Commission Meeting. Any Ward IV resident willing to take on the job, is asked to write a letter to the city stating that desire, before the next commission meeting (August 4th). 1. ... $18,385 payment to Alex N. Sill Co. as reimbursement for collection of insurance monies collected. -- Approved -- This was a percentage of the amount recovered prior to a law suit filed by Collinsville City Attorney Ken Underwood which recovered additional funds from the Dec. 2001 City Hall fire. CMA 2. ... approve raw water contract with Washington County RWD #3. -- Tabled for this session as negotiations are still in progress. "After much reflection and sole searching, I have decided that I must resign from my position as City Commissioner, Ward IV effective immediately. I would appreciate you accepting this resignation at your July 21st meeting, and also consider a nomination for my replacement on the same agenda. The voters' confidence in my abilities and my genuine concern for the continued growth of the City of Collinsville make this decision especially difficult. I will be forever grateful for the invaluable experience I aquired while serving as commissioner. Also the friendships I have developed here have made my time successful and productive. It has indeed been an honor to serve my hometown." 3. Consideration and possible action to appoint new commissioner to Ward IV. -- tabled -- The Mayor requested Ward IV citizens interesting in the position to write to the City prior to the next meeting. 4. ... set $75 rate for EMS "Treat No Transport" ambulance runs... -- The motion approved authorized the City Attorney to draft an ordinance which covered this fee (and perhaps others which are now tied to Medicare rates). 5. ... proposed ordinance 734 (second reading) ... easement changes for Stonegate Addition -- Ordinance Approved. 6. Presentation of award and program presentation by Collinsville Downtown, Inc. -- See Photos and text (above right). New business: Local developer Kyle Smalygo, announced a proposed development at the intersection of Highways 20 and 75. There would be approximately 480 acres, mostly residential 1 acre tracks. About 25 acres would be commercial and would be nearest to the Highway 75 side. Although there was no city action possible as this was not on the agenda, Kyle wanted the city to be aware of these plans as he would be requesting the city sewer system be extended to the property and eventual annexation. He would like city help with right of way and coordination with ODOT. He mentioned a possible buy-back program for folks along the extention to also use the sewer system. Kyle indicated this was a 12-year project. Alice Johnson, Collinsville's liason within the Oklahoma Main Street Program, thanked the city for it's role in helping Collinsville reach the Million Dollar Milestone. 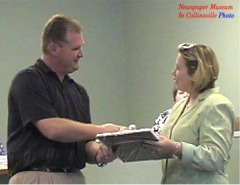 Mayor Michael Sirmon accepts a plaque from Deborah Berry, Collinsville's Main Street Program Coordinator. The plaque signified Collinsville's first million dollars in private reinvestment associated with the revitalization of Main Street. This amount is based on donations of volunteer time and services in addition to actual dollars.